This field is not available for casual use. The Amesbury site is town property and must be reserved by the club for specific dates for our launches. Launching at other times by other people is not authorized. Woodsom Farm Park is a huge, 500 acre, town-owned field located near the seacoast on the MA-NH border. The field is the one of the best available in New England, allowing us to launch up to J motors. We usually have to schedule our launches around the mowing of hay, but it is worth the hassle. Above is an aerial photograph of the 370 acre Woodsom Farm Park field. Our launch site is located at the end of the dirt road in the top center of the picture. The entrance to the field is at 213 Lion's Mouth Road. Look for the lion statue and turn in to the driveway. 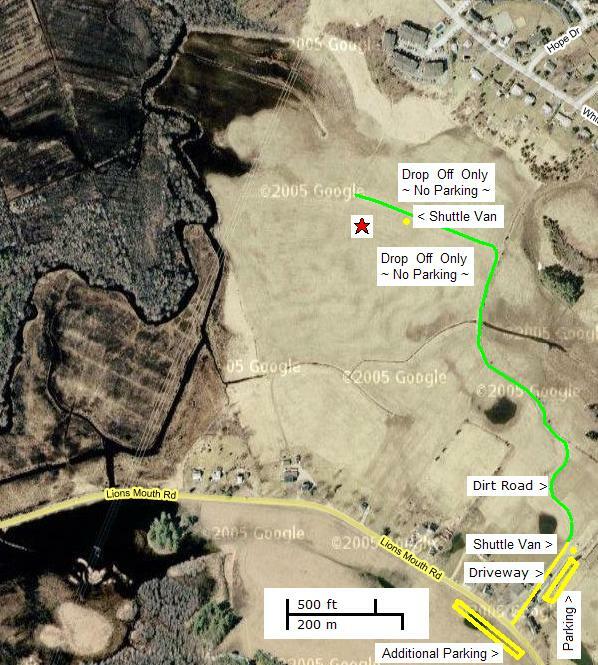 Drive slowly past the soccer field parking lot and drive up the dirt road to the launch site. Keep your speed down to about 10 mph to avoid raising dust clouds and road damage. We can not park on the field this year so you will drop off your equipment at the launch site and then drive back to the soccer field parking lot and park there. A shuttle van will bring you back to the launch area. This unfortunately is a part of our use permit from the city of Amesbury. NOTE: Vehicles are not allowed to venture off the dirt road to the flight line but you may turn around on the grass next to the dirt road. You will need to carry / cart your equipment a short way from the dirt road to the flight line. The field is not open to the public and is reserved by the club for specific dates for our launches. Launching at other times by other people, club members or not, is not authorized. If the weather looks questionable, please check the home page of the CMASS website at: http://www.cmass.org. You can aslo call the CMASS Launch Line at (857) 242-6277 (85 72 4CMASS) before heading out to the field after 8:00 AM on the morning of the launch for the launch status. Please do NOT call the above number for schedule date/times changes which are posted at http://www.cmass.org. Get to I-95 N. Stay on I-95 N and take the RT-110 W exit, exit number 58B, towards I-495/AMESBURY and merge onto MACY ST/MA-110W. Stay on RT-110 W for several miles till you come to the light at MA-150/HILLSIDE AVE. Take a RIGHT at the lights onto MA-150/HILLSIDE AVE. Go another 0.4 miles and turn LEFT onto HIGHLAND ST. After another 0.4 miles turn SLIGHT LEFT onto LIONS MOUTH RD. Woodsom Farm Park is 0.7 miles ahead on the right at the lion statue. Get to I-95 S. After entering MA take the I-495 S exit, exit number 59, towards WORCESTER and merge onto I-495. Go 2.0 miles on I-495 and take the RT-150 exit, exit number 54, towards AMESBURY. Keep RIGHT at the fork in the ramp and merge onto MA-150 EXT. Go ahead 0.4 miles where MA-150 EXT becomes MA-150/HILLSIDE AVE. crossing MA-110. Go another 0.4 miles and turn LEFT onto HIGHLAND ST. After another 0.4 miles turn SLIGHT LEFT onto LIONS MOUTH RD. Woodsom Farm Park is 0.7 ahead on the right at the lion statue. Get to I-495 N. Take the RT-150 exit, exit number 54, towards AMESBURY. Keep RIGHT at the fork in the ramp and merge onto MA-150 EXT. Go ahead 0.4 miles where MA-150 EXT becomes MA-150/HILLSIDE AVE. crossing MA-110. Go another 0.4 miles and turn LEFT onto HIGHLAND ST. After another 0.4 miles turn SLIGHT LEFT onto LIONS MOUTH RD. Woodsom Farm Park is 0.7 ahead on the right at the lion statue.